FAYETTEVILLE, Ark. — Behind a 1-2-3 finish in the 3,000 meters, the Men of Oregon track and field team brought home its second straight NCAA Indoor team title Saturday with 74 points at the Randal Tyson Track Center. Eric Jenkins followed his win in the 5,000 meters Friday by capturing the 3,000on Saturday in 7:58.81. Jenkins won with a kick in the homestretch that pushed him past teammate Edward Cheserek, who won the mile earlier in the day. Will Geoghegan was third, giving Oregon 24 team points in the event, after the Ducks entered the event needing 11 to clinch the title over Florida. The Oregon women saw their streak of team titles end at five, despite exceeding last year's winning total with 46.5 points to trail only host Arkansas.Jenna Prandini followed her long jump title Friday by finishing second in the 200 meters and fourth in the 60 on Saturday; her 23 points made her the high-point scorer in the meet, while Cheserek led male competitors with 20.5, just ahead of Jenkins' 20. The Men of Oregon led the team race entering Saturday, on the strength of Jenkins' victory in the 5,000 and another in the distance medley relay duringFriday's opening session. The Ducks had entrants in only two events Saturday, but it was an historic group — five in the 3,000 meters, matching the meet record, and three more in the mile. While the Men of Oregon got 70 of 74 points in the middle distances, the UO women scratched and clawed for points in varying events over the course of the weekend. Saturday began with sophomore Brittany Mann setting a school record in the shot put with a mark of 55 feet, 11 1/4 inches in the preliminary rounds. As the last round began that mark was good for eighth place, but Mann uncorked an effort of 57-1 to rocket up to third. "That pumped everybody up," said Jasmine Todd, who would go on to finish third in the 60 meters, in 7.22 seconds. "That adrenaline just carried over into the 60, the mile, the hurdles, throughout the day." Prandini finished just behind Todd in the 60, in 7.24, and was second in the 200 in 22.74. Freshman Ariana Washington was sixth in the 200 in her first championship meet, in 23.07. Prandini said of her races Saturday that "both of them I could have executed a little better," but her 23 points were the most at the championship meet among all male and female competitors. And though the UO women saw their streak of titles end, they outscored last year's team that included such stars as Laura Roesler and Phyllis Francis. "One of the (opposing) coaches said, 'We thought you were wounded ducks when you came in here, no pun intended,'" Johnson said. "For the women to come in here and fight like they did today, a valiant effort — nobody in the country thought we'd be standing out here with a second-place trophy." The women beat the form chart with a point or two here and there throughoutSaturday, beginning with Mann in the shot put. Freshman Nikki Hiltz got things started on the track in the mile when she outraced Villanova's Stephanie Schappert for eighth place, and a point for the team. Hiltz made her final push in the third turn of the banked indoor oval. "I made my move right by the Oregon team," she said. "So I just got this wave of energy." That level of support helped carry Sasha Wallace to fifth in the 60 hurdles in 8.23, after her fall in the event a year earlier. Now the Ducks will use it to recharge for the spring season, in which both teams again will be in the hunt for NCAA titles. "There's a lot of people out there practicing hard, getting ready for outdoors," Prandini said. "I think there's a lot more to come." FAYETTEVILLE, Ark. - Oregon's powerful distance runners nailed shut the NCAA Indoor Track & Field Championship with a flourishSaturday in Randal Tyson Track Center. Eric Jenkins, Edward Cheserek and Will Geoghegan went 1-2-3 in the 3,000-meter final to clinch the Ducks second consecutive men's indoor title before 4,538. Oregon finished with 74 points, far ahead of second place Florida, which had 50. The Ducks did virtually all of the damage in four distance events. They scored 70 points in the mile, 3,000, 5,000 and distance medley relay. Greg Skipper contributed the other four with a fifth-place finish in the weight throw. Oregon went over the top with an epic 3,000, in which the Ducks had five entries. Jenkins, who previously had won the 5,000, finished first when Cheserek slowed just before the finish line. Jenkins crossed in 7 minutes, 58.81 seconds. Cheserek, who already had won the mile and anchored the winning DMR, crossed in 7:59.42. Geoghegan, digging hard, finished in 8:00.44. "The perfect scenario," Jenkins said. "We knew with five guys, that something like 1-2-3 could happen," Geoghegan said. The men's team battle was supposed to be an all-out fight between Oregon and Florida. Instead, the Ducks ruled. The UO women's team also outperformed the pre-meet form charts to finish second. Arkansas won with 63 points. The Ducks finished with 46.50. Oregon had won the previous five women's indoor titles, but wasn't predicted to be in the top five in this one. "The men are fricking fantastic," UO coach Robert Johnson said. "But I would be remiss if I didn't talk about the women. One of the coaches said, 'I thought you were wounded ducks when you came in here, no pun intended.' Nobody in the country thought we would be standing out here getting a second-place trophy." The Ducks had no individual victories in the women's events contested Saturday, but they scored across the board. Brittany Mann picked up an unexpected third-place finish in the shot, Jasmine Toddand Jenna Prandini went 3-4 in the 60, and Prandini and Ariana Washington went 2-6 in the 200. Sasha Wallace was fifth in the hurdles. Freshman Nikki Hiltz surprised by scoring a point with an eighth-place finish in the mile. Prandini was the meet's high-point woman. It was a good time while it lasted. Oregon led the women's standings for the longest time Saturday, but couldn't hold off a late Arkansas tidal wave. 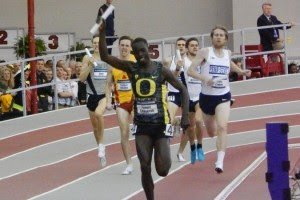 Cheserek - the meet's high-point man -- got the Ducks rolling by winning the mile. Teammates Johnny Gregorek and Daniel Winn were fourth and sixth respectively as the Ducks pulled 18 points out of the event. Cheserek ran conservatively, keeping Montana's Cristian Soratos in his sights, before rocketing away on a 28.26-second final 200 to win in 3:57.94. He said UO distance coach Andy Powell had told him to sit back as long as possible. "I said, 'Man, this is going to be tough,'" Cheserek said. "I was ready. I was prepared for the mile." Which explains what happened when he cut loose. 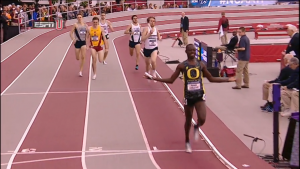 Soratos tried to go with him, but Cheserek was having none of it. The Ducks ran the 3,000 as a team. It was Jenkins' job to push the pace in the middle of the race. 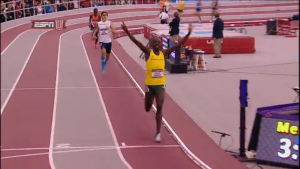 Cheserek was supposed to sit until it was time to uncork his monster of a kick. "I knew I had to help the team out and help the guys out, because everyone was on tired legs," Jenkins said. It went as planned, although Cheserek let up to let Jenkins complete his winning double at the end. 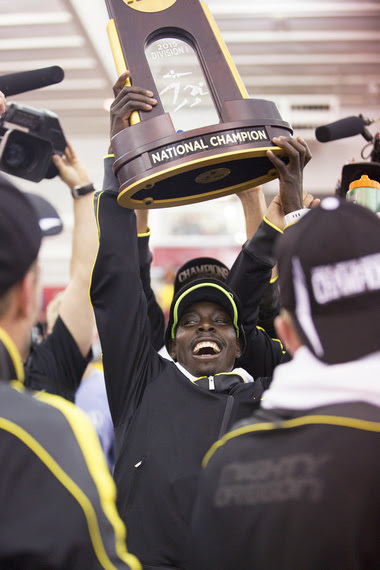 "When I saw my teammate I thought, 'Let him take it,'" Cheserek said. "Because he's my teammate anyway. We're not rivals." The entire UO team was on the rail along the back straight to cheer on the Ducks in the 3,000. There was a similarly vocal presence supporting Mann in the shot, which was contested in an adjacent building. She channeled it into puts that broke her own school record twice in her six-throw series. Her last attempt traveled 57-1 and took her from eighth to third in the event standings. "It was really cool," Mann said. "I looked over and all my teammates were sitting there. For throwing, you don't always get a huge crowd." Prandini said Mann's clutch throw was the spark the Ducks needed. "I think we showed that we're scrappy, and we can fight," she said. "We're not going to roll over and die when we face competition." FAYETTEVILLE, Ark. — Behind a 1-2-3 finish in the 3,000 meters, the Men of Oregon track and field team brought home its second straight NCAA Indoor team title Saturday, tying the meet record with 74 points at the Randal Tyson Track Center. After anchoring the winning DMR a day earlier, Cheserek ran another scalding mile Saturday, winning in 3:57.94. Johnny Gregorek was fourth in 4:04.30, and Daniel Winn was sixth in 4:04.44. The women beat the form chart with a point or two here and there throughout Saturday, beginning with Mann in the shot put. Freshman Nikki Hiltz got things started on the track in the mile when she outraced Villanova's Stephanie Schappert for eighth place, and a point for the team. Fayetteville, AR — Pundits expected the 2015 men’s mile final at the 2015 NCAA Indoor Track and Field Championships to come down to a battle between Montana State senior and 3:55 miler, Cristian Soratos, who was making his first appearance at NCAAs, and Oregon’s five-time NCAA champ Edward Cheserek. (Editor’s note: We feel a little foolish having written this considering what happened later in the 5000). We asked him whether he thought that he moved too aggressively at 600 as the stats show that Soratos’ move was a little too much for himself to handle (each of his final laps was slower than the previous one). Soratos replied by saying wasn’t paying attention with splits and that his intention was simply to go as hard as he could for as long as he could. In the end, he would have had to summon a 27 or faster on the final lap to beat Cheserek — putting him at around 2:18for the final 1000. FAYETTEVILLE – The multi-talented Jenna Prandini was all over the Randall Tyson Track Center during the first day of the 2015 NCAA Indoor Championships, Friday, helping the Ducks in their hunt for a sixth-straight NCAA Indoor Title. Prandini earned one of three Oregon NCAA titles on the day with a win in the long jump while Eric Jenkins and men’s distance medley relay ended the day with championships as well. Prandini added Oregon’s first indoor long jump title to go with the one she earned last spring at Hayward Field, setting a school record with a jump of 21-10 (6.65m) on her second attempt. With a busy day ahead she passed on her final four attempts in order to prepare for the prelims of both the 60 and 200, where she did not disappoint. The newly minted national champion set a personal best of 7.15 in the 60, winning the first heat to advance to tomorrow’s final along with teammate Jasmine Todd who finished second in the second heat in a time of 7.17. The two now both have personal bests of 7.15 set this season, tying them for second on the Oregon all-time list and tenth in collegiate history. In Prandini’s last event of the day, the 200, fatigue was still out of the question. The junior ran to a 2015 world-leading mark of 22.52 which vaults her to No. 6 on the collegiate all-time performers list. She will be joined in the final by freshman Ariana Washington who won her heat in a personal-best time of 23.21. Senior Eric Jenkins was part of a patient 5,000 group which included teammates Parker Stinson and Will Geoghegan. The three stayed connected throughout a tactical race with many position changes. With 400 meters remaining, Jenkins broke free and held off Arkansas’ Kemoy Campbell to win his first NCAA Championship in 13:48.36. Stinson repeated his third-place finish (13:52.79) from 2014 while Will Geoghegan tacked on two more points to total 18 with a seventh-place finish (13:56.11). The Ducks finished the day on the highest note possible, as Colby Alexander, Marcus Chambers, Niki Franzmair and Edward Cheserek rallied to win the DMR in 9:30.53. Alexander and Chambers put Oregon in the middle of the pack before Franzmair moved up to third during an outstanding 800-meter carry, handing the baton off to the five-time NCAA Champion. Cheserek made up the gap on leaders Iowa State and Georgetown before creating a gap of his own en route to a win by nearly two seconds. While in the hunt for a team championship, where every point is vital, the Ducks outperformed the dope sheets with key showings from Greg Skipper and Lauren Crockett. Skipper grinded his way to a fifth-place finish in the weight throw. The redshit junior secured the final spot in the finals, sitting in ninth and one point out of scoring position. On his final throw, he flew up the leaderboard to fifth, unleashing a mark of 72-6.50 (22.11m) for four points to become Oregon’s first Indoor All-American in any men’s throwing event. Crockett, who finished ninth at the Championships a year ago, started the day for the Ducks by picking up 3.5 points while tying for fifth in the high jump. The senior only missed one attempt on her way to a successful clearance of 6-0.50 (1.84m), picking up her third All-American honor in the process. The Men of Oregon lead the team race after five scored events with 32 points, nine ahead of second-place Arkansas. The women have 13.5 points after the first day and trail first-place Georgia by half a point. The Ducks were nearly perfect in qualifying, advancing nine of ten athletes to finals of their events tomorrow. Edward Cheserek (3:58.69) and Johnny Gregorek (3:58.75) went 1-2 to open the competition in the mile, securing their spot in the finals with a surge down the home stretch. Daniel Winn followed in the next heat, making it 3-for-3 while qualifying in second place with a time of 3:58.50. Nikki Hiltz advanced to the final in the women’s mile, qualifying on time in a personal best 4:37.90. Sophomore Sasha Wallace will be looking for redemption in the 60 hurdles after she did not finish in the indoor finals last year. Wallace advanced on Friday, finishing in 8.18. Men’s DMR: King Cheserek What Else Did You Expect? 3:57.68 later we were right. Oregon coach Andy Powell didn’t even wait that long to celebrate. We saw him start giving people high-fives once Cheserek hit the homestretch. Cheserek himself started celebrating halfway down the homestretch. Cheserek blew everyone away when he went to the lead just before the bell. He looked sensational. We’ll try to watch a race replay to get his final 200 split later, but trust us, he looked good, very good. 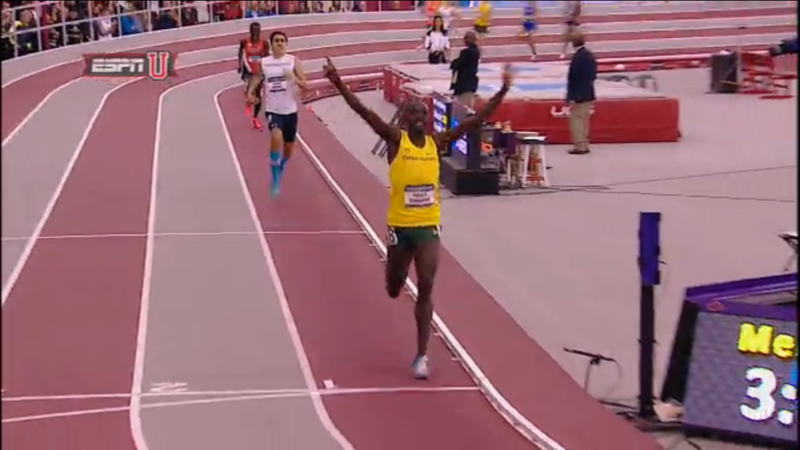 Cheserek had time to celebrate halfway down the homestretch. Nothing could stop Cheserek after the first three legs kept him close to the lead. The one fear in a DMR is that a superior anchor leg like Cheserek might lose if he goes out too hard to catch the leaders. But Cheserek was less than three seconds back of the leaders so it was almost impossible for him to go out way too hard. Even if he went out in 25 (he went out in 27ish), he’d probably still be able to beat the people he was running with as they’d all have to go out in 28 to get him to go out in 25. The one guy we thought might be able to scare Cheserek — Villanova’s 3:36 man Jordan Williamsz – got the baton some 4.66 seconds after King Ches. It should be pointed out that Williamsz was very good. He split 3:55.46 to help Villanova get fifth (the fastest anchor leg by over two seconds), but he was running in no-man’s land for most of this one as he only passed two teams. We’re not exactly breaking new ground with this point. But Cheserek came back three hours after running a 3:58 mile (closing in 26.76) and absolutely destroyed the competition in the men’s DMR. As long as Cheserek got the baton within a few seconds of the lead, there was no way he was losing this race. Not many runners can win a 10K cross country title in November and come back to anchor the winning DMR at NCAAs four months later (The last guy to do it? Fellow Duck Galen Rupp in 2008-09). This won’t be his last NCAA title, but we need to appreciate just how special this guy really is. The Ducks are now halfway to a sweep of the distance races (mile, 3k, 5k, DMR) and by the time all is said and done, Cheserek might have won three of them. Oregon head coach Robert Johnson expressed a little concern that Cheserek ran too hard in the mile prelim earlier in the night, but Cheserek said the mile prelim was not that hard for him and he even backed off the final lap when he destroyed everyone. Oregon senior Eric Jenkins put the hammer down and went to the lead just before 4k and got the win by pulling away from Arkansas’ Kemoy Campbell over the final 200 thanks to a super last lap of 26.80 (as he won in 13:48.36 to Campbell’s 13:49.55). In the process, Jenkins erased the negative memories he had from the last time he raced on this track — in 2013 he was DQ’d after initially having the biggest breakthrough of his career (7:46) and crossing the line second at NCAAs in the 3k. Oregon’s Parker Stinson was 3rd in 13:52.79 and Oregon’s Will Geoghegan was 7th in 13;56.11 to pick up valuable points for Oregon in the team race, but Geoghegan was a little disappointed as he was 4th entering the final 400. After a slow opening 2000 (5:48.05 for Jenkins after the leaders hit 1600 in a pedestrian 4:37), the pace started getting faster at 2k thanks to some front-running by a number of guys including Texas’ Craig Lutz and Colorado’s Morgan Pearson (neither of whom would score). In the end, Jenkins, a 13:18/7:44 performer, was pretty darn good over the latter stages of the race. In addition to closing in 26.80, he ran his last 400 in 56.15, his last 1k in 2:29.33 and his last 3k in 8:00.29. With that type of squeeze, it was no surprise that it was down to a two-person race with 400 to go. Campbell, with the home crowd’s support, did his best to try to take down Jenkins and become Jamaica’s first NCAA distance champ, but in the end, Jenkins was just too good. 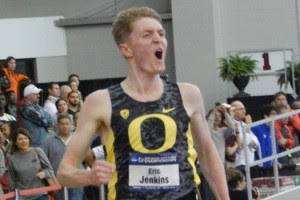 Jenkins went through two coaches at Northeastern, was DQ’d at NCAA Indoors in the 3000 in 2013 (nullifying a 7:46 PR and second-place finish), and then transferred to Oregon where he played second fiddle to Edward Cheserek during all of 2014. He accomplished a tremendous amount before tonight (pbs of 7:44/13:18, runner-up finish at NCAA XC) and though the focus for Oregon at NCAAs is always on the team, Jenkins deserves some recognition for his individual title. He said it was nice to finally be in a race where he didn’t have to get second to teammate Edward Cheserek and Jenkins looked like a stud over the final 1000 meters, closing in 2:29.33 with a 26.80 last lap that finally broke Campbell. Consider this: no American man had won an NCAA title at a distance longer than 1500 meters (indoor/outdoor/cross country) since Elliott Heath accomplished the feat at 3000 meters in 2011. Jenkins ended the streak tonight, and he’s got a chance to add to his title tomorrow night in the 3000.